This week, we are beginning our series of posts featuring some of the cheat sheets that we have created. The purpose of these cheat sheets is to act as a quick reference guide to various SEO and online marketing topics. Our blended search cheat sheet was created to provide a high level overview of blended search and the different types of blended results that you should be optimizing for. More about optimizing for blended search. 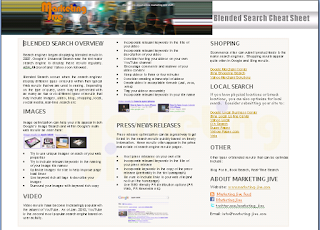 Download our blended search cheat sheet.